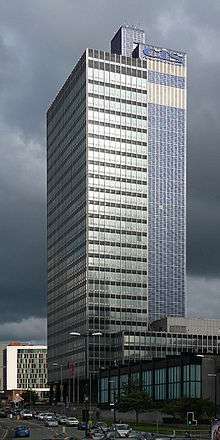 The CIS Tower is an office skyscraper on Miller Street in Manchester, England. It was completed in 1962 and rises to 387 feet (118 m) in height. The Grade II listed building, which houses the Co-operative Banking Group, is Manchester's second-tallest building and the tallest office building in the United Kingdom outside London. The tower remained as built for over 40 years until maintenance issues on the service tower required an extensive renovation which included covering its facade in photovoltaic panels. 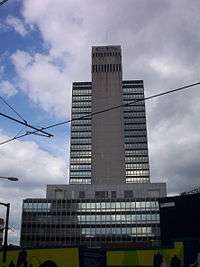 The tower was designed as a prestige headquarters to showcase the Co-operative movement in Manchester. In 1958 the company proposed building an office tower block, construction began the following year and was completed in 1962. 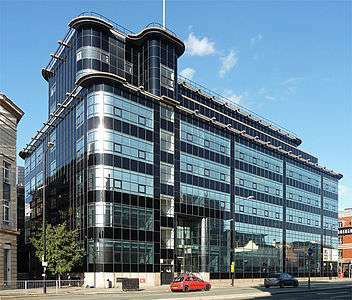 It was designed by Gordon Tait of Burnett, Tait & Partners and Co-operative's own architect, G. S. Hay. In the 1990s, it was granted Grade II listed building status by English Heritage. 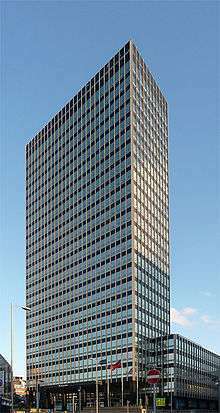 The tower, described as "the best of the Manchester 1960s office blocks", was listed for its "discipline and consistency". It is part of a group with New Century House and its Conference Hall on Corporation Street. The tower's design was influenced by Skidmore, Owings & Merrill's Inland Steel Building in Chicago after a visit by the architects in 1958. In 1962, at 387 feet, the CIS Tower overtook the Shell Centre as the tallest building in the United Kingdom, a title it retained for a year until it was replaced by the Millbank Tower in London. 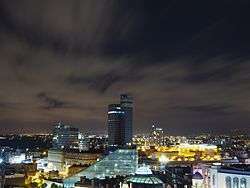 In 2006 the Beetham Tower became the tallest building in Manchester. The office tower building rises above a five-storey podium block. It has a steel frame and glass curtain walls with metal window frames. Black vitreous enamel panels demarcate the floor levels. The building materials, glass, enamelled steel and aluminium, were chosen so that the building could remain clean in the polluted Manchester atmosphere. The tower's concrete service shaft, which rises above the office tower, has two bands of vents at the top and was clad in a mosaic made up of 14 million centimetre-square, grey tesserae designed to shimmer and sparkle. The projecting reinforced concrete service shaft houses lifts and emergency stairs. The ground floor is set back behind six pillars. A green bronze-like, abstract mural sculpted by William George Mitchell made from fibreglass covers the entrance hall's rear wall. The building has 700,000 square feet of floor area with clear open spaces on the office floors. Interiors were designed by Misha Black of the Design Research Unit. The executive areas are delineated by the use of teak and cherry wood veneers. Within six months of construction some of the mosaic tiles on the service tower became detached owing to cement failure and lack of expansion joints in the concrete. Although the tower was granted listed building status in 1995, falling tiles were an ongoing problem. English Heritage had to be consulted as alterations could change the building's appearance. In 2004 CIS consulted Solarcentury with a view to replacing the deteriorating mosaic with 575.5 kW of blue building-integrated photovoltaic (PV) cells which would provide a permanent green energy solution, generating approximately 180,000 kWh (average of 20 kW) of electricity per year. 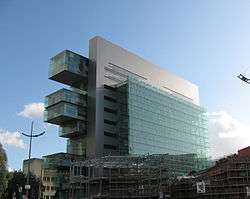 The work was completed by Arup and at that time was the largest commercial solar façade in Europe. The PV cells made by Sharp Electronics began feeding electricity to the National Grid in November 2005. The project, which cost £5.5 million, was partly funded by the Northwest Regional Development Agency which granted £885,000 and the Energy Savings Trust at the Department of Trade and Industry (DTI) contributed £175,000. The solar power project was chosen by the DTI as one of the "10 best green energy projects" of 2005. Out of sight on the roof are 24 wind turbines generating 10% of the tower's electricity. Wikimedia Commons has media related to Co-operative Insurance Tower.